Go beyond the coloring book with this stunning mandala embroidery kit . . . complete with reusable iron-on transfers! Why should coloring book fans have all the fun? These embroidery-ready transfers make it super-simple to stitch beautiful, meditative mandalas for any craft. Usually, transferring the pattern to fabric is the hardest part, but here you just iron them on and go! Use the transfers to create embroidery-hoop pieces, or embellish favorite bags, shirts, or pillows. Once the pattern is transferred, just take your needle and floss and stitch along the lines to “color” the designs any way you’d like. The process is easy and relaxing, and the results are gorgeous. 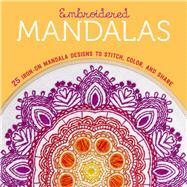 Includes 25 iron-on mandalas and 16 pages of basic embroidery instruction for crafters of all levels.